The latest upgrade to iTunes hasn't added any breathtaking features or content, at least not the broad expansion of FairPlay DRM-free music many enthusiasts were looking for, but it is worth taking a longer look at. As usual, iTunes 8 is available as a free download from Apple and again as usual, it's bigger than ever at around 65MB. My install kept looping the first time out – it didn't seem like having Microsoft Outlook running simultaneously, but installed on the second attempt. The first noticeable difference is the new grid view. Visually, it's rather uninspired and boxy. However, as it focuses on albums, artists, genres and composers rather than individual tracks, it should be easier to organise large music collections. 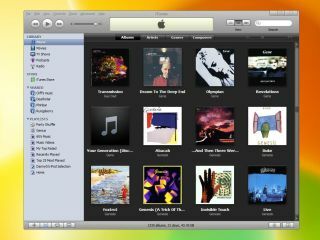 Where a group contains more than one entry (Rock genre, say), you can mouse over the icon to see the albums it contains – similar to the way iPhoto shows multiple photos taken on the same day. It's pretty but not particularly useful. Sticking with visuals, iTunes 8 has a new 3D visualiser: a firework-strewn space-scape with orbiting spheres that pulse and explode in time with the music. It looks pretty stunning but devours memory like it's going out of fashion. If you're wondering why I'm taking so long to get to iTunes 8's highlight feature – the Genius recommendation services – I'm wondering the same myself. Turning on the Genius sidebar brings up a terms & conditions screen where you have to permit Apple to collect (anonymously, of course) information about your music library, listening habits and iTunes Store purchase. The next step is that iTunes gathers information from your library – a process that started an about an hour ago for library of nearly 10,000 songs and is just about complete. Right – it's finished looking at my library. Let's start it on an easy one – Adam Ant's Stand and Deliver. Pressing the Genius button (an atom icon) at the bottom of the window instantly puts together a 25-song playlist featuring the likes of Blondie's Hanging on the Telephone, The Jam's That's Entertainment and The Special's A Message To You Rudy near the top, a bit of Primal Scream and Cornershop in the middle and some Blur and Pulp crowd pleasers at the end. Not bad. The Genius sidebar (which you can close) suggests I buy Ant Rap, Puss in Boots and Making Your Mind Up from the iTunes Store. Hmm, thanks but no thanks Mr Jobs. Similarly, a search on Amon Tobin pulls up an excellent playlist comprising Mr Scruff, Boards of Canada and Jaga Jazzist, and suggests a few obscure Amon Tobin tracks to buy. A tougher test – Caribea by 70s' jazz legend Moondog produces a flurry of useful shopping options, including Thelonious Monk and Jelly Roll Morton, but no results at all from my 10,000-song library. At this point, I'm prompted to 'Update Genius' from the Store menu – still no joy. Overall though, it's a pretty impressive result for day one and, of course, the Genius service should get better the more people use it. A welcome addition to the iTunes family.